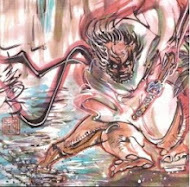 Cover Image: Once again, the cover image for this chapter is also the first panel of the story. The image this time is a bottle of Nostalgia perfume, for which we have seen numerous ads throughout the story thus far, and which is also Sally Jupiter’s fragrance of choice. This bottle of Nostalgia is significant to this chapter, as this particular bottle was given to Laurie by her mother, according to Laurie’s dialogue in Chapter VIII, page 22, panels 4-6. And in this way, the bottle of Nostalgia connects mother and daughter. Panel 1: The caption – “Laurie?” – as spoken by Dan, links up this image of the tumbling bottle of Nostalgia perfume with Laurie, signifying it is hers and foreshadowing that Laurie will be taking a journey through her memories over the course of this chapter, in order to discover a hidden truth about her past. All of the nostalgia that has clouded her memory will finally be drained away to reveal the secret of her heritage that Laurie has kept suppressed all these years. 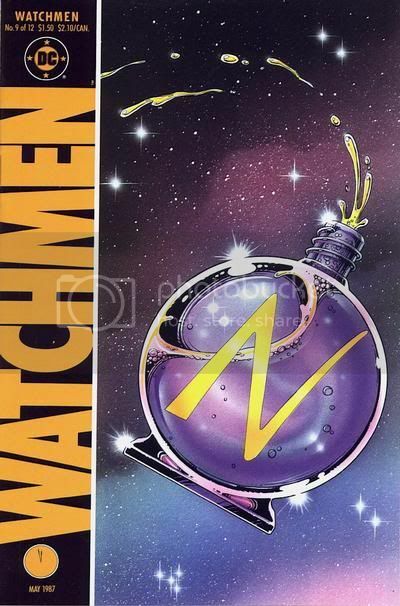 This tumbling bottle of Nostalgia will continue throughout the chapter, emphasizing Laurie’s emotional journey, which is the lynchpin to the final act of Watchmen. Labels: Alan Moore, Chapter 9, chrisbeckett, cover image, Dave Gibbons, Page 1, Watchmen, Who Watches the Watchmen?